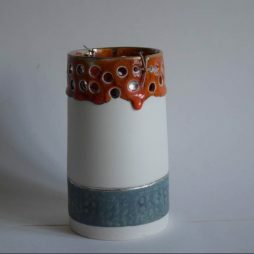 Moya started making ceramics in her spare time while working as a news journalist for independent radio, Channel 4 and BBC Television. 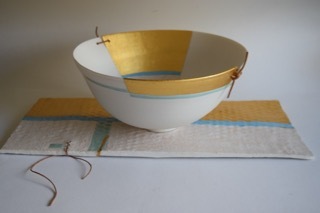 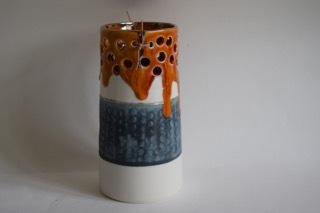 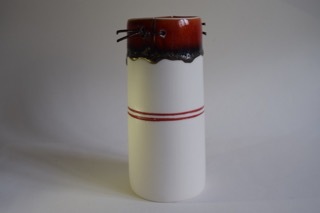 She continued making while bringing up a family and in 2014 put her practice on a professional footing by studying for a Master’s Degree in ceramics, graduating from the University for the Creative Arts, Farnham, in 2016. 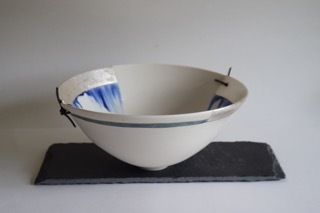 She throws with porcelain and plays with ideas of contrast, juxtaposing different glaze textures, colour intensities and surface ﬁnishes – glossy with matte or satin; bright colours with white; smooth areas with carved and incised ones. 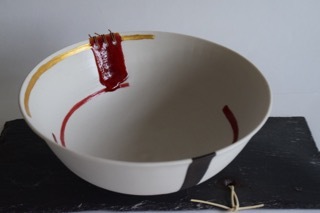 As a counterbalance to porcelain’s whiteness she uses strong blocks of glaze colour, enriched with strips and drips of lustre as well as gold, platinum and silver leaf. 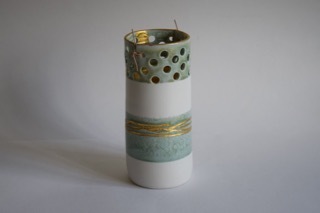 This creates an equilibrium where all elements highlight and complement each other. 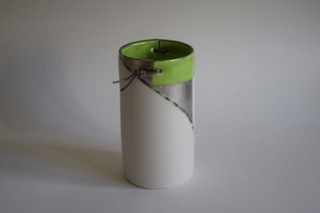 Her characteristic leather ‘stitching’ creates an added visual and tactile dimension.